I am currently carrying a G23 in a Dragonleather belt slide. I used to carry a Kahr P9 when “feeling lazy”, but a combination of a thick Galco gun belt and Dennis’ craft makes a G23 feel like a featherweight. In the past, I wore a police dress belt (black, $20 at the local cop shop) which worked well enough for IWB holsters. After about a decade of use, it started to show age. One day, when trying to find a decent looking dress belt, I pulled the Galco item from the photo prop box and tried it. It turned out to be so thick that my cell phone holder wouldn’t go over it. On the up side, I can now wear a full-size steel 45 without the belt sagging. I stopped wearing my other belts because they feel so insubstantial by contrast…now I know why so many people urge their friends to upgrade that piece of gear! By the way, this image is now on the back cover of Concealed Carry magazine. This entry was posted in holster, pistol and tagged 45ACP, 9x19, belt, dragon, Galco, holster, leather, leathr, left, Para Ordnance, right. Bookmark the permalink. 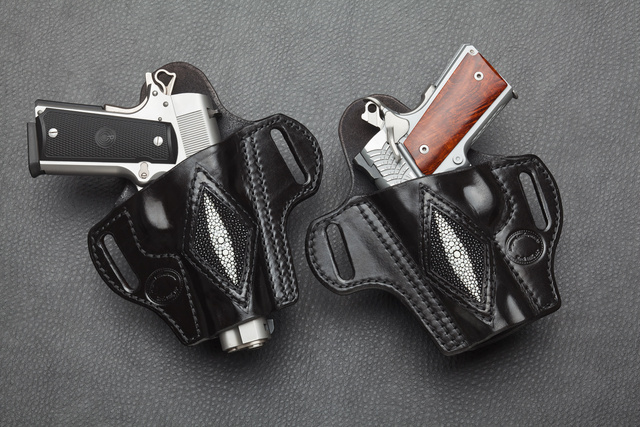 Dennis Makes great holsters, I certainly enjoy mine. I also need to get a better carry belt to go with them. BTW what’s the vintage on the Para? looks like an older one.